Are you ready for the best tasting soup you have ever eaten? 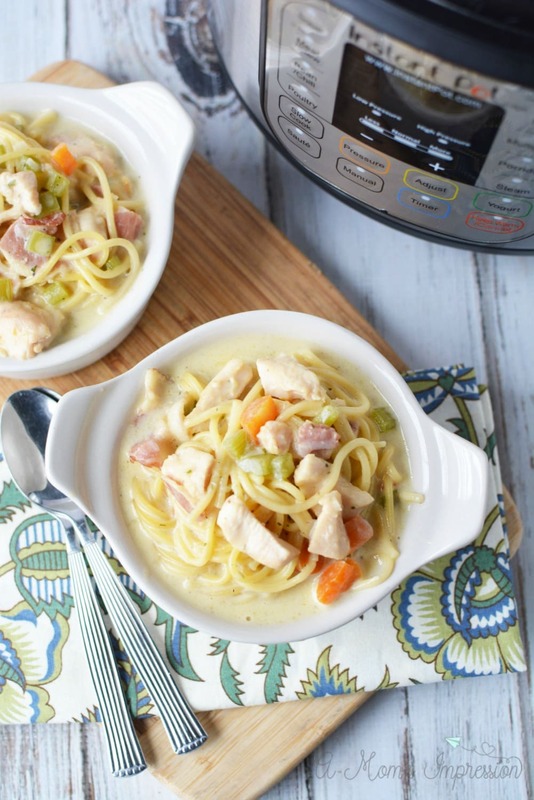 This Instant Pot Crack Chicken Noodle Soup recipe is so easy and ready in about 20 minutes using your electric pressure cooker. 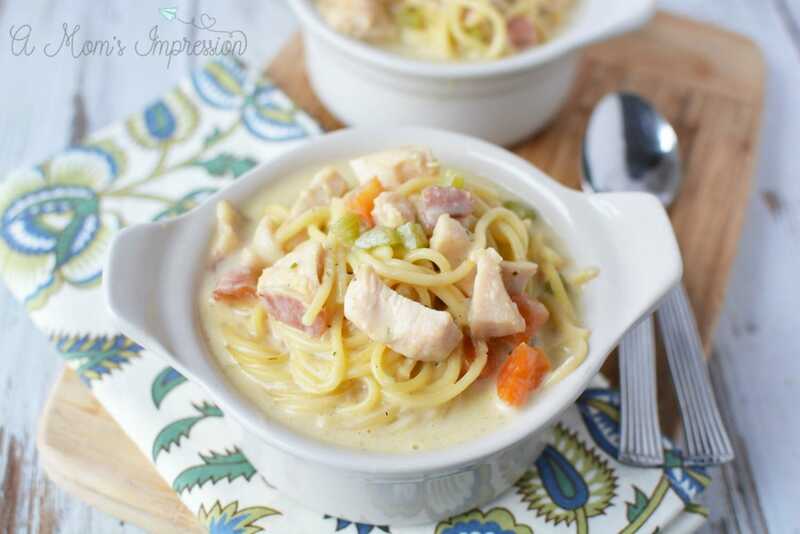 Perfect for super picky eaters, this is a great family-friendly meal that everyone will love! Have you ever made a recipe and knew it was going to be a winner before you even tasted it? 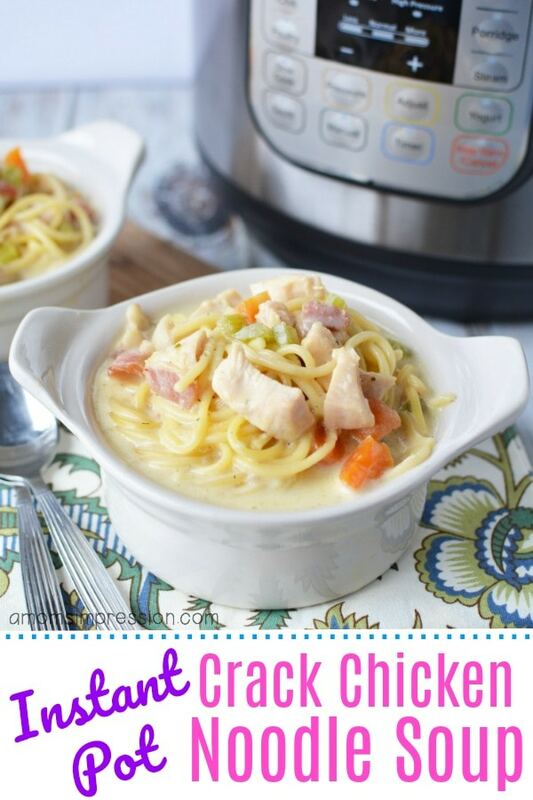 That was my experience with this pressure cooker chicken soup recipe. One of my family’s favorite recipes is crack chicken and my Instant Pot Crack Chicken sandwiches are my most popular recipe on our site. 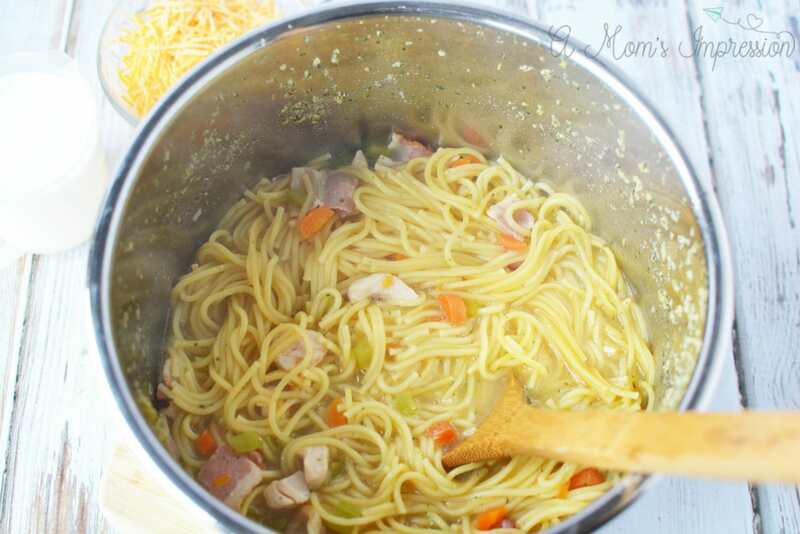 The last time I made it, I thought to myself that a version of it would make the best homemade chicken noodle soup and I was right! 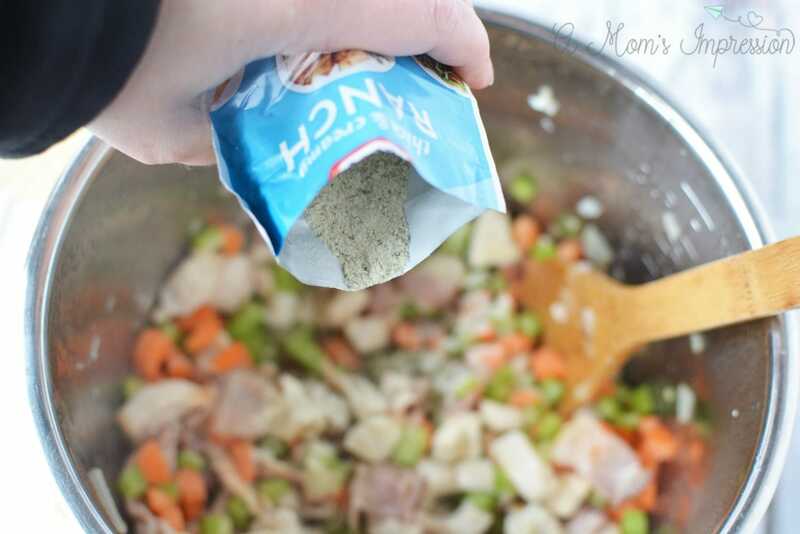 crack chicken soup, chicken, carrots, celery, ranch mix, cheddar, and half and half to make it creamy and delicious. 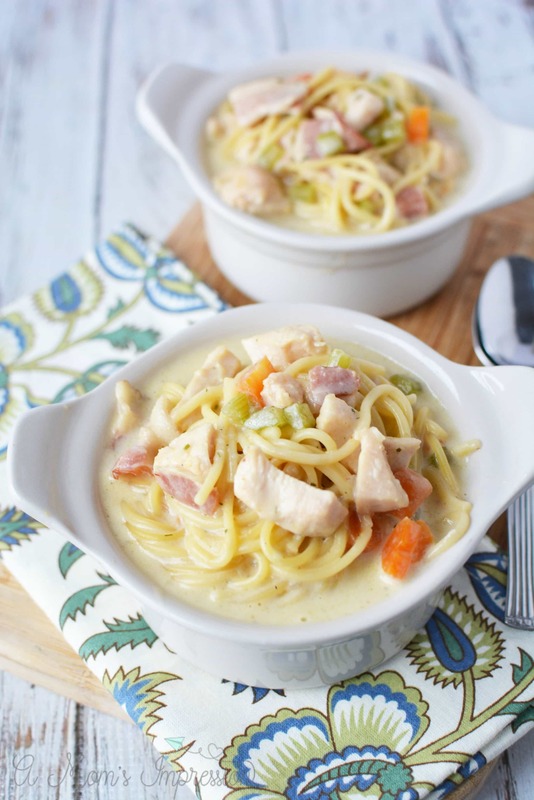 It is the perfect kid-friendly Instant Pot meal. Making soup in our pressure cooker is one of my favorite things to do. The Instant Pot makes everything taste like it has been slow cooking for hours, yet it takes just minutes. We love recreating our restaurant favorites like our Olive Garden Copycat Zuppa Toscana soup and Broccoli Cheese Soup. 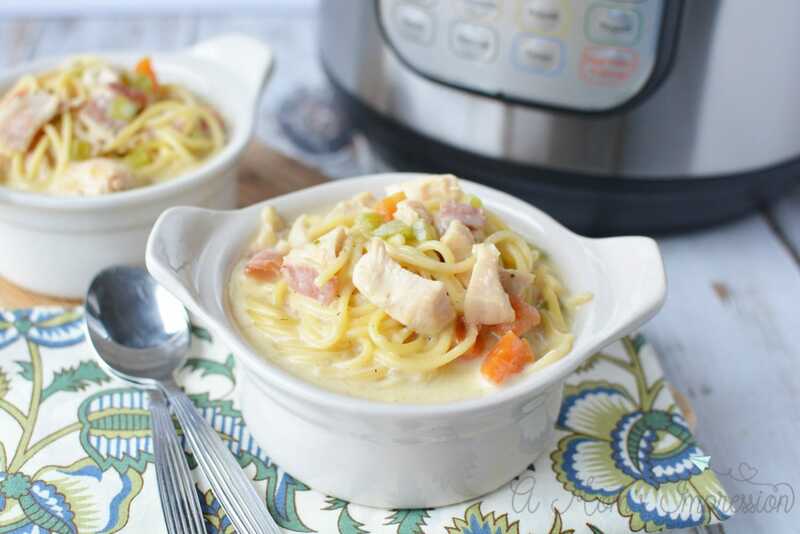 As well as creating fun new soups to try like our Instant Pot Irish Colcannon soup.Whatever cuisine you are feeling like, the pressure cooker can make it taste even better in a fraction of the time. Scroll down for a printable version of this recipe. 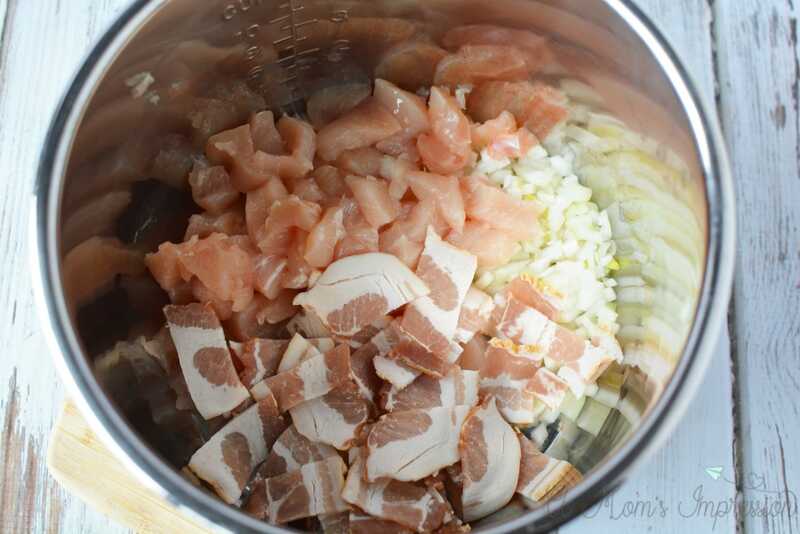 Place chicken breast, bacon, and onion into the instant pot. 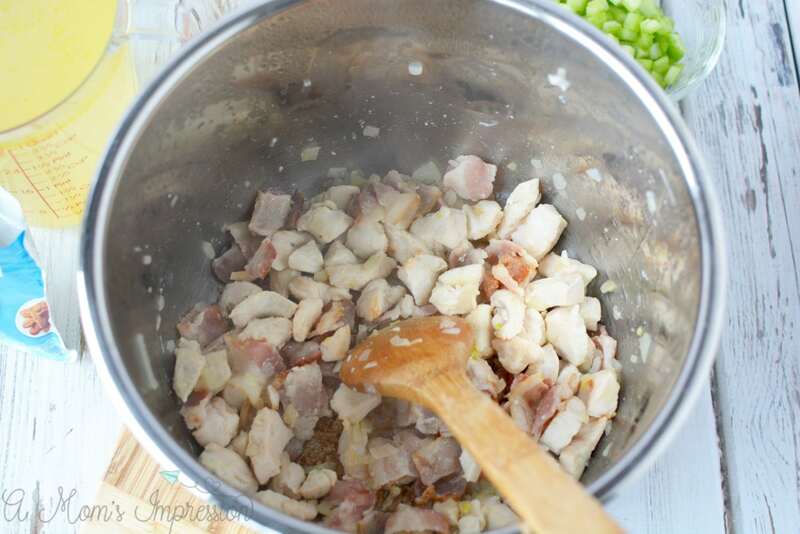 Use the saute function to cook the chicken and bacon, stirring frequently. Add carrots, celery, ranch seasoning and broth and mix well. 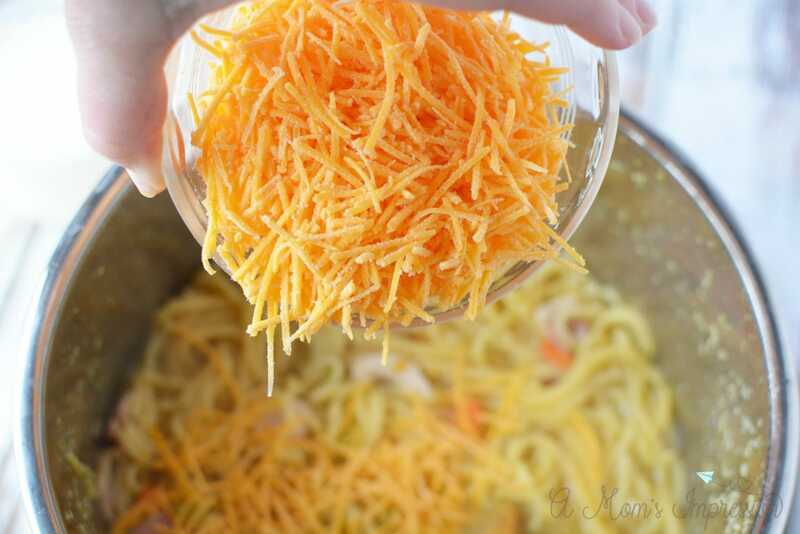 Break spaghetti pasta in half to fit into the instant pot if necessary. 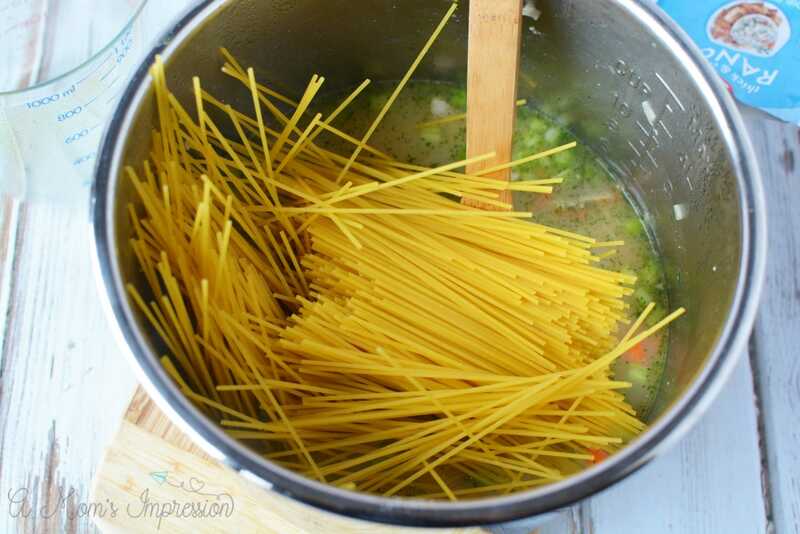 Press the spaghetti into the broth so the pasta is coated with liquid. Place the lid on the pot and secure it closed. Close the pressure release valve. Set the instant pot to manual, high pressure for 5 minutes. When cooking cycle is complete, quick release the steam and carefully open the pot. Stir in half & half until completely combined. *Note cooking time does not include the time it takes for the pressure cooker to come to pressure. I’m building up my Instant Pot skills! This looks like a meal my family would love! This looks delish! 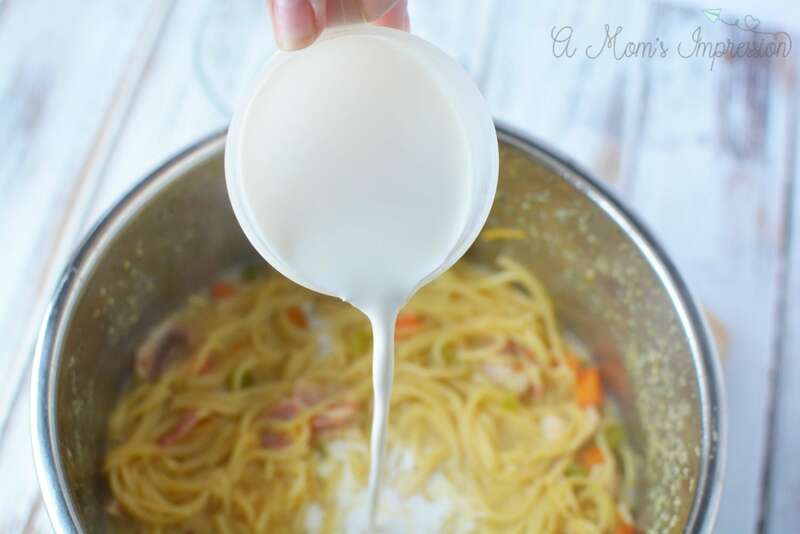 Perfect for busy baseball nights – quick, easy and filling! Yes, it is perfect for busy nights. Absolutely delicious. Will become a staple in our house for sure. Thank you for a wonderful recipe! Thank you so much. We love this year round! Yum! From the 3 year old on up, my entire family loved this. We didn’t have an onion, so we used dried onion flakes, and we used skim milk instead of half and half, but it was still delicious. We used whole wheat noodles and probably could have cooked it another few seconds to a minute, but it was still a big hit. Thanks for the easy recipe! This is yummy! The only change I would make is to sauté the carrots and celery with the onion/chicken/bacon in the first step, as mine were still a bit crunchy at the end. Other than that, it’s very good! Thank you! That is a good tip, thank you! 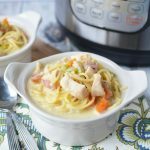 One of the first meals we made with our new Instant Pot and we loved it.